It’s been a hilarious morning here at I Love Classic Rock, and we only have wrestler Kevin Owens to thank for it. 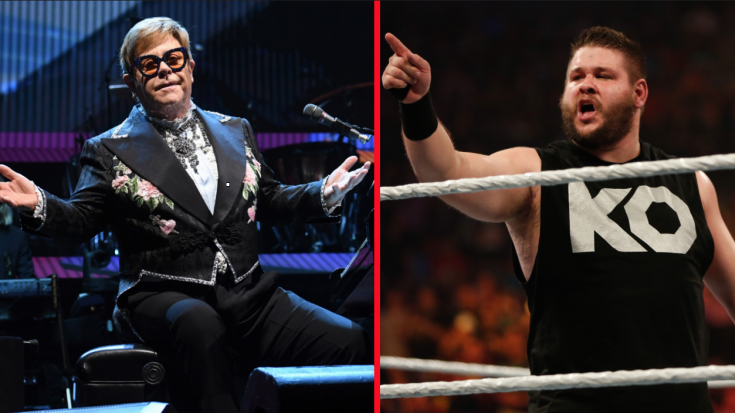 The 34 year old WWE star took to Twitter last night with some choice words for Elton John, calling out the 71-year-old singer over the social media platform after he was forced to cancel a show that Owens and his wife were attending. It was apparently date night for Mr. and Mrs. Owens when they and the crowd inside Orlando, Florida’s Amway Center were informed that Elton would not be performing that night due to an ear infection. Owens, who even donned a sweet pair of red heart shaped sunglasses for the occasion, was crushed – not because his date night was spoiled, but because he just really, really wanted to rock out to some Elton John tunes. “Hey, @eltonofficial, nobody ruins my wife and I’s date night except me!” wrote Owens, before offering up a challenge. “You, me…WresteMania [sic]. I’ve fought men in their 70s before, I can do it again!#KOvsElton #KOMania4,” referencing the time he delivered a serious beatdown to WWE boss Vince McMahon. Immediately, Owens’ Twitter lit up with fans offering up some pretty hilarious responses to his challenge. DO YOU SEE WHAT YOUVE DONE, ELTON!? ARE YOU PROUD OF YOURSELF!? But thankfully, the night wasn’t a total loss. Mr. and Mrs. Owens hit up a showing of Creed II where Kevin, in a show of protest, wore his red, heart shaped glasses.